I love it when films don’t take themselves too seriously. It allows them to fool around, to make jokes at their own expense, and to wink at us, the audience, so that we become part of the game. And that is exactly what happens with Baywatch, the movie. I have heard that some critics have written about how awful the movie is and whatnot, and I ask them: were you not aware of the irony this film exudes? From minute one, they are letting us know that this is going to be a meta film, a story that is going to break the fourth wall without actually breaking it. Did you not realise that all the jokes in the film were self-referential? Reviewers should have a different filter for films like Baywatch than for others like, let’s say, Moonlight -and I have reviewed them both, but I put on different critic glasses for each of them. That being said, for me, as someone who grew up watching the TV show, this film was straight-out hilarious. Just like the TV show took itself too seriously (something they even point out in the film, where they call it “far-fetched”), the movie takes advantage of this and shows a parade of jokes that turns it into a beach-based farce. Just remember the show: they always seemed to be solving crimes. Well, this is the main plotline of the movie, and the lifeguards are constantly being told off for trying to be cops (“when you do it, it’s just a bunch of guys chasing another bunch of guys” or “a bunch of guys investigating another bunch of guys”). The ever-captivating Priyanka Chopra plays the baddie here, who tries to get all the real estate in the area by, well, mafia-style deeds. But there comes a point where the actual plot is secondary. 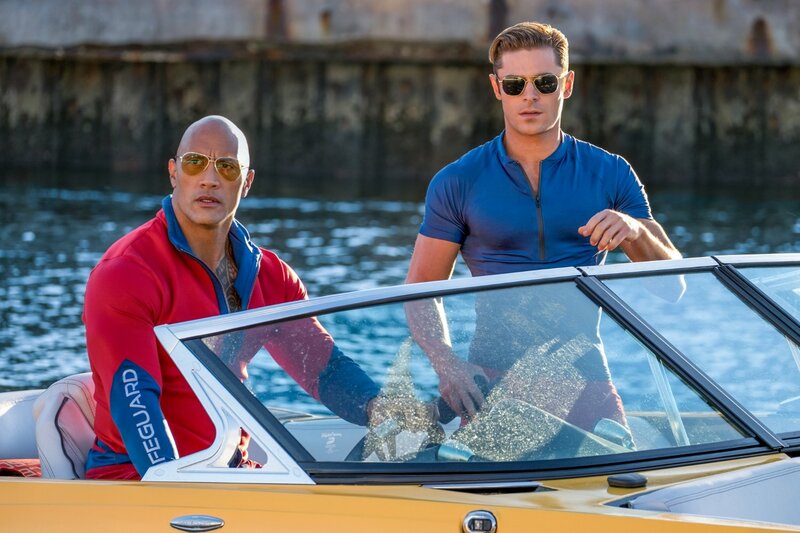 Dwayne Johnson, one of the most charismatic people we have in Hollywood right now, plays Mitch Buchannon, while Zac Efron plays Matt Brody, the target of his jokes (and believe me, Johnson has nicknames for Efron to spare). We even get some familiar names from the old show, like Stephanie, Summer, CJ and Ellerbee. They all help reinforce the nostalgia of this movie, while at the same time make us realise how ludicrous these characters were on the TV show, whereas here they are just literally making fun of themselves -there is a particular scene at a morgue that both grossed me out and had me laughing out loud. Forget anyone who tells you bad things about this movie. Have you not realised that this is Baywatch? A massive sign telling you this shows up behind Johnson at the beginning of the movie, nearly killing some dolphins! This is a film about a show where some lifeguards ran in slow motion and pretended to be detectives while looking great in swimsuits. It even makes fun of that! So do yourself a favour and join the fun, and try not to overthink everything you see on a screen. Sometimes it’s better to indulge yourself. Baywatch was just lighthearted fun, I really enjoyed it. The plot wasn’t perfect but it made me laugh, had some great subtle jokes, and was just a good time.